How do I get redshift to start with my computer? 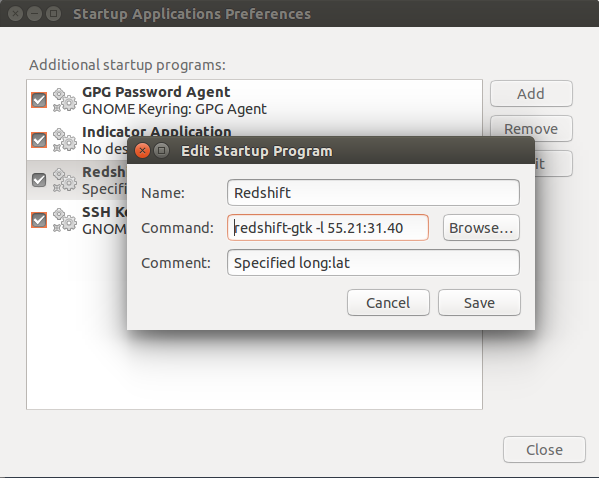 I have installed Redshift on my computer and it works fine with the command gtk-redshift. However, it would not start up automatically when using the same command in startup applications. How do I set it to automatically start? There is a known bug #868904 that stops Redshift starting automatically in 11.10 due to geoclue conflicts on startup. See Comment #17 on the bug report for a possible solution of setting the location permanently on start up. It is reportedly fixed in the package 1.7-1ubuntu2 but the Launchpad homepage for the project lists only 1.7-0ubuntu1 built 35 weeks ago. You could try downloading direct from their website to see if it fixes the issue with a later version. Crontab is a program that is running all the time. It has a list with programs and scripts and the exact dates or intervals that they should run. Crontab is used a lot by system administrators for making backups and automating tasks. where 56.20:16.35 is the LATITUDE:LONGITUTE of your location. Save and reboot. Upstart is a program that amongst other things, looks in specific folders at bootup for scripts to be run. So we can just add our program in there to have it run in every booutup. Upstart is more low-level than crontab and you need root privileges. Connect your computer to internet and run gtk-redshift in Terminal. ** (process:3541): WARNING **: Could not get location, 3 retries left. Once you get your Latitude and Longitude from above, Go ahead and Edit autostart config file for Redshift, which is found in "~/.config/autostart/"
In gedit window add "-l 18.98:72.83" next to "Exec=redshift-gtk"
Save this file and Reboot. Antoher workaround (comment #53) is to install geoclue-hostip. Even though on my setup (Ubuntu 13.04) the manual position workaround works, and I prefer it anyway because it allows me to indicate the location more precisely. Logout and log back in to see the changes. The xprofile is executed at the beginning of the X user session, after you log in to the graphical shell (Unity or Gnome). The command redshift -PO 4200 sets the temperature to 4200K. You can test the script by logging out and then logging in. Not the answer you're looking for? Browse other questions tagged startup-applications or ask your own question. Flux for ubuntu 14.04 - possible? How do I debug a program which I set to start at login, but it doesn't? How do I start a program automatically when I boot? How can I view stdout/stderr of a startup application? How do I start conky when ubuntu starts up?